The this reference always points to an object’s own instance. Any object can use the this reference to refer to its own instance. Think of the words me, myself, and I: anyone using those words is always referring to themselves. 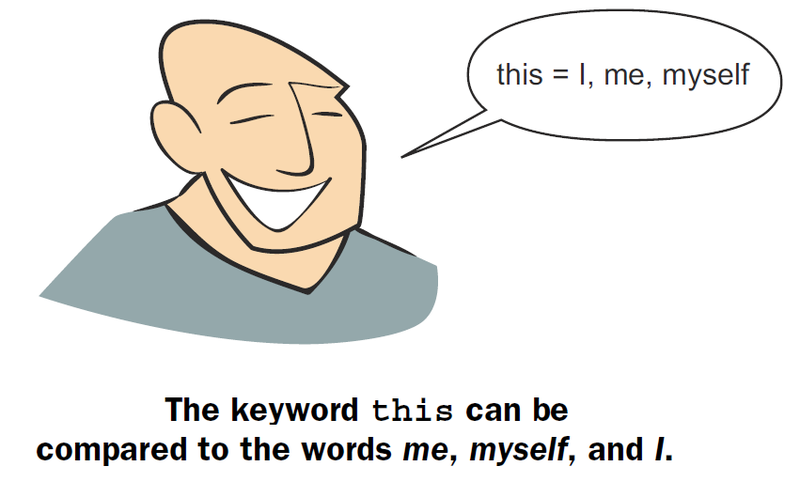 In this post, we'll look into the use of 'this' keyword and it uses in java with example. Within an instance method or a constructor, this is a reference to the current object — the object whose method or constructor is being called. You can refer to any member of the current object from within an instance method or a constructor by using this. It clarify that you are talking about a field, when there is another variable of the same name. 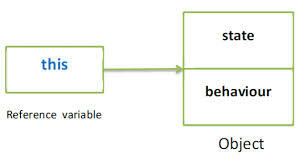 Some use this as a means to differentiate instance variables from local variables or method parameters. Invoke other constructor of the current class in your parameterized constructor. 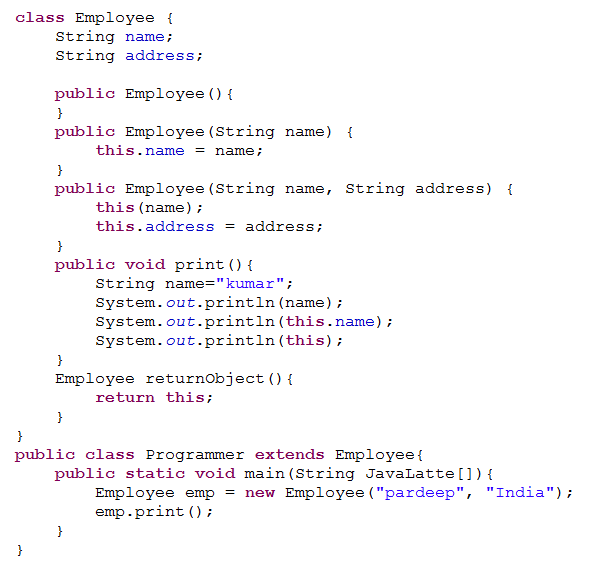 In the previous example, the class Employee defines an instance variable with the name name. The Employee class constructor also defines a method parameter name, which is effectively a local variable defined within the scope of the method block. Hence, within the scope of the previously defined Employee constructor, there’s a clash of names, and the local variable will take precedence. Using name within the scope of the Employee class constructor block will implicitly refer to that method’s parameter, not the instance variable. In order to refer to the instance variable name from within the scope of the Employee class constructor, you are obliged to use a this reference. If present, a call to a constructor from another constructor must be done on the first line of code of the calling constructor. Inside a class method, when a local variable have the same name as one of the instance variable, the local variable shadows the instance variable inside the method block. Thanks you so much for this nice article about Java this keyword .